Both radical Islamists and far right groups feed off the ‘otherisation’ of groups presented as oppositional to their local and global identity formations. Far right groups want to reclaim particular locales as part of a process of ‘taking back’ ‘their country’, while Islamists have little or no claim on the local, focusing instead on globalised identity politics. Both groups experience fragmented masculinities: men, displaced by the shifting economic contours of post-industrial societies, the impact of deindustrialisation upon traditional labour markets, and the withering of national identities due to neoliberal globalisation, are retreating into violent hegemony as solutions to their malaise. The response of the state is to reinforce a narrow historical reading of society and close down discussions of diversity, inclusion and multiculturalism instead of focusing on equality, integration and social interdependence in the light of widening inequalities and a decline in political trust and increasing cultural division. Young people aged 18 to 24 are susceptible to numerous challenges. While hate crimes spike due to acts of violence after various terrorist events, the reality is that these abate over time. This suggests that something far more fundamental is going on in the background. Space matters for identity formations, as does a sense of conflict towards the immediate most differentiated ‘other’. However, the question of ideology remains important. In an ironic twist, far right extremists want to reclaim their local territory in their own image, whereas radical Islamist extremists have abandoned the local in preference for the global, or rather the idealised notion of the caliphate, which is conceptual and for the most part illusory. Pitted against each other in the most extreme of conditions, leading to a sense of extended enmity, paradoxically they are fighting for different political outcomes. Far right extremists and radical Islamists may have more in common than that which divides them. For example, both groups project: resistance against aspects of left-liberalism found in the pages of The Guardian, the alleged pro-government bias presented in the BBC, resistance against the LGBT, or a misogynist attitude towards women per se. Yet, what is clear is the sense of personal grievance that leads to hate supported by an ideology, which is then wrapped around doomsday scenarios. For radical Islamists, it is the end of times, for far right groups it is the idea of a race war. Both groups are somehow victims in their respective shadowy scenarios. Invariably, critical thinking and the need to prevent the dehumanisation of the ‘other’ are valuable solutions, particularly in the crucial area of mentoring and support for vulnerable young men at the heart of de-radicalisation policy. Research on the topic of reciprocal radicalisation confirms that processes of ‘othering’ exist in the minds of young, angry and disillusioned young men suffering the consequences of the decline masculinities in an age of globalisation. However, instances of mental illness, psychological breakdown and issues concerning self-actualisation and self-realisation are also of importance. Unquestionably, a historical process of the ‘othering’ of groups has evolved over time incorporating in the Twentieth Century alone, Jews, African Caribbean groups as part of the Windrush Generation, East African Asians in the early 1970s. Contemporary processes centre on the catchall term ‘Muslims’ During this time, the ‘self’ (the nation) is consistent in its approach, although its intensification has transformed. Notions have shifted away from the idea of problematic immigrants coming to the nation to exploit its resources, take advantage of its women and to subdue existing groups. All thought patterns emerging from centuries of imperialism, colonialism, eugenics and scientific racism leading to deep-seated structural and cultural racism. In the current period, the ‘other’ is not simply a threat based on the classical tropes of racism. It also takes on a new purpose based on questions of national security such are the consequences of the ‘war on terror’ culture that has dominated the landscape of discussions of Muslim-non-Muslim relations that emerged following the end of the Cold War. Over time, the consistent theme is that ‘we’ must resist most that which is furthest away from who ‘we’ do not see ourselves as, while ‘we’ are an indivisible unitary whole facing further pressure as a result of localisation, globalisation, neoliberalism and the backlash against diversity. In understanding local area concerns about urban spatial formations of bio-extremisms, the local and global intersect at the point at which groups are furthest apart culturally, socially and politically but closest together economically. All of this points to wider issues of economic inequality, social immobility, structural marginalisation and patterns of discrimination in the labour market that affect the former white working classes as well as visible minorities and in the current climate Muslim groups. Given ethnicity, class and gender, a homogenised notion of ‘the Muslim’ is undoubtedly the most visible of ‘others’, metaphorically, symbolically and physically. The discussion of radicalisation cannot generate new ideas without some of the wider social and economic contexts in which it occurs. 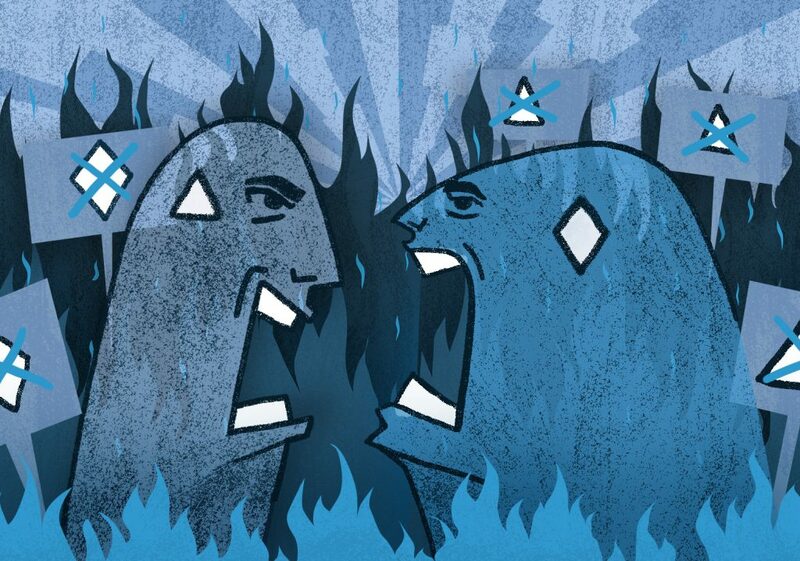 If groups pitted against each other are in a state of perennial conflict, the conclusion is to focus on the actions of the dominant towards the dominated, with the idea that power, authority and hegemony as the determining motivations of those who seek to subjugate the ‘other’ or the minority. The groups categories are central in determining individual behaviour at the level of communities, where individuals outside of their immediate communities are moved to extremism, radicalisation and ultimately, in some cases, terrorism as a response to those very communities but also to aspects of wider society. It is therefore crucial to be careful on relying on deep theory or emotional responses to this malaise. Arguably, this has been part of the problem all along. Radicalisation is a complex notion, with a range of variables vital in determining the nature of the radicalised. When the removal of certain variables has an overarching effect, in other cases a single trigger is the reason for the tipping point to radicalisation. However, this unknown provocation remains an obscure and undefined compound variable. 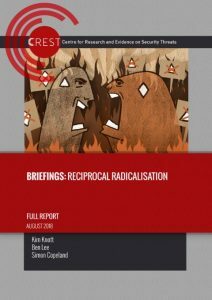 The discussion of reciprocal radicalisation of far right and Islamist extremism in the UK context is a significant topic, however it is far from a flawless association. There is a need to provide conceptual clarity based on empirical research. But in the absence of new research, there remain challenges in understanding this relationship conceptually and theoretically as well the policy implications it generates for policy thinking in this area. Professor Tahir Abbas, FRSA is currently Visiting Senior Fellow at the Department of Government at The London School of Economics and Political Science, UK. He is author of Contemporary Turkey in Conflict: Ethnicity, Islam and Politics (2017), editor of Muslim Diasporas in the West (4 vols), and co-editor of Political Muslims (2018). Abbas, T. 2017b, Ethnicity and Politics in Contextualising Far Right and Islamist Extremism’, Perspectives on Terrorism 11(3): 54-61. Abbas, T. 2011, Islamic Radicalism and Multicultural Politics: The British Experience, London and New York: Routledge.